Training run for Pizza Grand Prix, originally uploaded by Seligmans Dog. I'm having a training run tonight with my beloved Firedome. Got a gig at the Wild Goose Creative on October 18th in the Pizza Grand Prix. Tonight's warm up is a basic 10 pizzas for a few friends in the Firedome. Tonight I'll be using a different lighting method: chimney of fuel to ignite the surrounding fuel, using simple briquettes and timing the available cook time for one charge of fuel with my datalogger. The Firedome is not convenient to charge midstream. A significant limitation if I want to push this to production level cooking. Modifiications will have to be made if this is the goal. The other thing I'll be checking is amount of dough per pizza. I'm shooting for 10-12" pie with 225 g per shell. This should give a thin crust, but not paper thin. Toppings will be classic. Chiffonade of basil, tomatoes and mozzarella. A few will be the wife and I's favorite: grilled eggplant, caramelized onion and chevre (not classic, but good). I'll post the final Temp vs. Time profile. I'm also hoping this run gets me 700+ °F. We'll see. 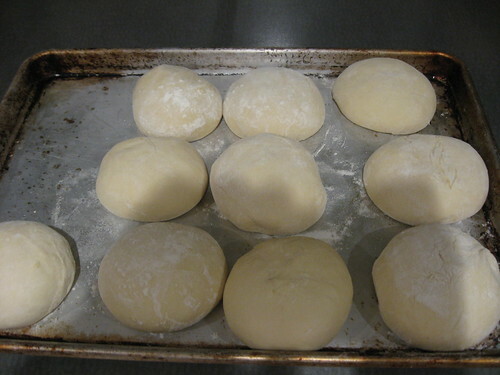 For the dough. I made it about 24 hours in advance. I made a kilo at a time in my bread machine, scaled and rounded/balled it into 225 g lumps and chilled it in the freezer for 20 minutes. Then these were placed in retarding containers in my fridge for ca. 18 hours, punched down, re-rounded and are now ready for pushing into shells tonight. Serf! Hand me my armor.